for more than 30 seconds; such as "the liner." Upon learning how much it would cost to add a beautiful custom liner that matched our invitations, I hopped onto Etsy to see what it might take to DIY. One popular item was the "map liner." Me being in a crafty mood I decided to give it a try. 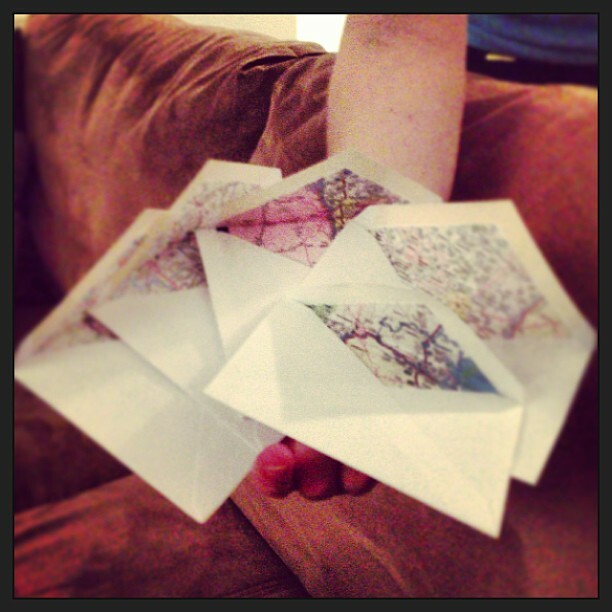 I had a bunch of sample envelopes and old maps (the paper kind, not the ones that talk to you). Trim the envelope so that you can determine the size of the liner. Trace the liner size onto cardboard and cut out the template. Use the template all over the map to make liners. I thought I would "save" space and use the entire map by alternating upside-down ones, but this resulting in upside-down liners, so I forgot about that. Using a glue stick, insert the liner into the envelope! Voila! I used the pre-existing folds in the map to line up with where the envelope fold was so that there weren't extra creases. Turned out, that even when creases were not lined up, if you glue properly you can't even see them. Also, I love crafting - if you have any Shariously fun, easy and practical crafting ideas let me know! It's so funny that I was checking etsy to help a friend to choose her wedding invitation cards and I came across the same thing. I also found Watercolor Wedding Map DIY very interesting.